The Greenway wastewater treatment plant in London, Ontario. Sludge dewatering is achieved using two centrifuges that operate continually, while one is in standby mode. 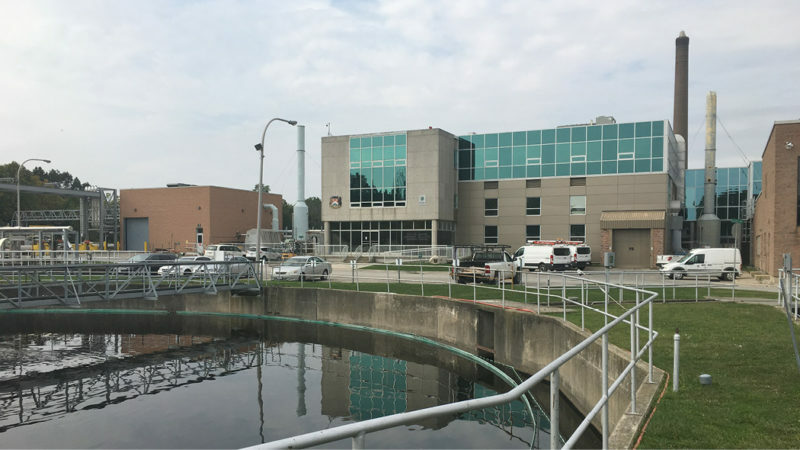 Located along the Thames River, London Ontario’s Greenway wastewater treatment plant takes in sludge from six other city treatment facilities. Upon arrival, sludge dewatering is achieved using two C7E Flottweg centrifuges. In 2012, the Greenway plant decided to replace its belt presses with Flottweg centrifuges. “Sludge dryness can greatly affect overhead,” said Geordie Gauld, division manager at the Greenway plant. By increasing sludge dryness from 24% to 25%, the plant was able to burn it in incinerators without the aid of natural gas. This results in an annual savings of about $700,000. “The centrifuges are also producing cleaner and more consistent centrate,” said Gauld. The plant currently treats approximately 17,000 dry tons of sludge per year. After it is burned, left over ash is hauled to a nearby landfill. 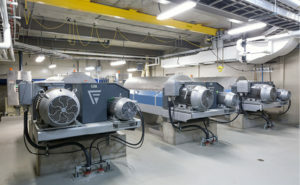 There are three C7E Flottweg centrifuges reside in the plant. Two operate continually, while one is in standby mode. The machines are rotated into standby on scheduled intervals, at which point they are taken through preventative maintenance. Watch: Solids dewatering at the Greenway plant. Flottweg’s engineering staff analyzed the plant’s process and incorporated ancillary equipment into the control system provided. For example, the sludge feed pumps and polymer feed systems are controlled by Flottweg controls. The changeover from belt presses to centrifuges was not entirely seamless. For example, polymer consumption increased and centrifuge parts tend to be more expensive than belt press parts. However, these added costs were more than offset by the natural gas savings and the fact that there are fewer wear parts in a centrifuge, which makes repairs faster, lowering labour costs. The biggest offset is that the centrifuges remove more moisture, which in this case reduces incinerator demand. During startup, the plant did experience a bearing failure on a centrifuge. With Flottweg’s help, it was determined that the culprit was an incorrectly sized centrate line. Since the plant installed a larger line, the machines have been running without issue. In the past, energy consumption was a big concern with centrifuges. However, the electric motors driving centrifuges have become more efficient. Also, centrifuge technology has evolved to harness spin to create more spin. One such innovation was Flottweg’s Recuvane® which was introduced in 2012. Within a centrifuge, energy is required to accelerate the separation medium to operating speed. The liquid separated from the solid is normally discharged without pressure. This means the energy contained in the liquid is lost. The Recuvane system enables this rotational energy to be recovered by targeted centrate discharge, thus supporting the main drive and reducing energy consumption. It is possible to save 10% to 20% of the work energy, depending on the pond depth and sludge composition. Water mills and turbines also use this principle to harness flowing water energy to perform work. Further centrifuge improvements include the optimization of the drive system, or more specifically, the differential speed between the decanter bowl and decanter scroll. Differential speed determines the length of time the solid remains in the bowl, and thus has a significant influence on the separation process. The bowl and differential speeds can be adjusted independently of one another during ongoing operation. This control is only possible with a special transmission mechanism. In 1995, Flottweg invented this special transmission mechanism and called it the Simp-Drive® (i.e., special planetary epicyclic gear unit). The change from belt presses to centrifuges helped the Greenway plant regain reliability and consistency of the system and is expected to cover demand for the next 20 years. The system has helped reduce costs and simplify operations. According to Marcoccia, the C7E machines are much easier to work on from a maintenance perspective. Daniel Lakovic is with Flottweg Separation Technology. This article appears in ES&E Magazine’s October 2017 issue.